Adding resin and wood knobs to the IKEA dresser, we took it from drab to fab! You can update virtually any piece of furniture by just changing out the hardware. We found these fun knobs at Homegoods for less than $10. Wood is a great way to warm up the standard IKEA white. Replacing the top of the small side table with an inexpensive piece of stained plywood and adding wood slats to the bottom of the clothing rack, we were able to add personality and warmth without breaking the budget. We picked up some frames very inexpensively at a store that was going out of business. The artwork from IKEA wasn't quite the right size, so we just trimmed it to fit! So this is not an IKEA hack, but it is a hack of sorts. We found a large canvas with a really bad painting. With a coat of primer to cover the old artwork, we literally had a blank canvas! My daughter channeled her inner Chihuly and created this piece of art. The light fixture we spotted at a department store inspired us to create our own version. It softens the space while adding some fun and funky texture. A couple of cute hanging planters make up for the lack of a headboard and add life to the space. 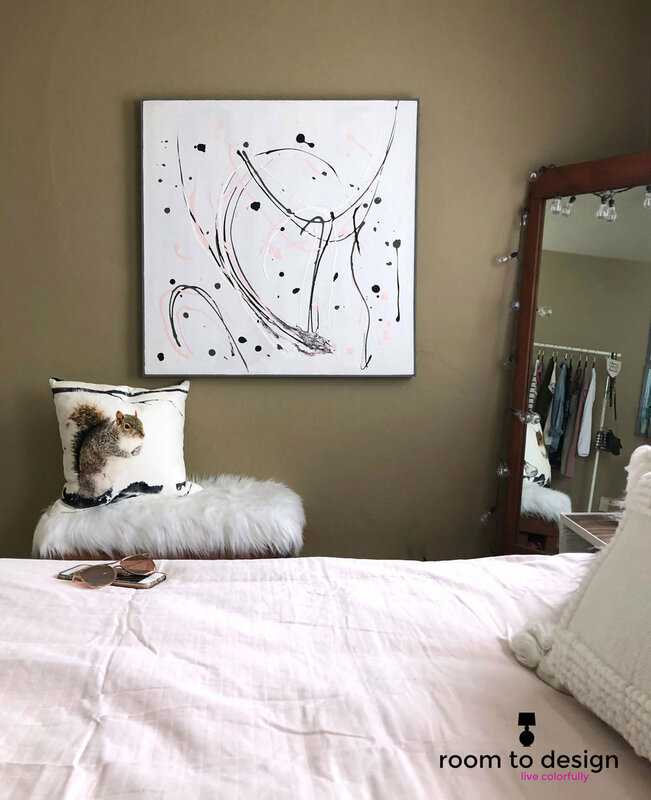 A small gallery wall with personal artwork that can be added to over time, finishes the wall on the other side of the bed. We added a little bit of boho texture to the faux fur and shiny gold pillows she took from her room at home. The elongated shape of the pillow completes the bedding ensemble. With thrift store finds, IKEA hacks, creative DIYs we were able to put this room together for less than $500. If you need help putting your space together, drop me a line.